Fact: Effectively coping with our emotions is said to be a key leadership skill in the workplace. Another fact? Emotions are hard. Here’s why: it feels nearly impossible to decipher what’s considered “professional” without crossing the line into “inappropriate” territory. So, instead of chancing it, we’ve learned to suppress, suppress, suppress. The first step in effectively dealing with your emotions is learning how to identify, or label, them. What is it you’re really feeling? But like I said before, it’s much harder than it sounds. 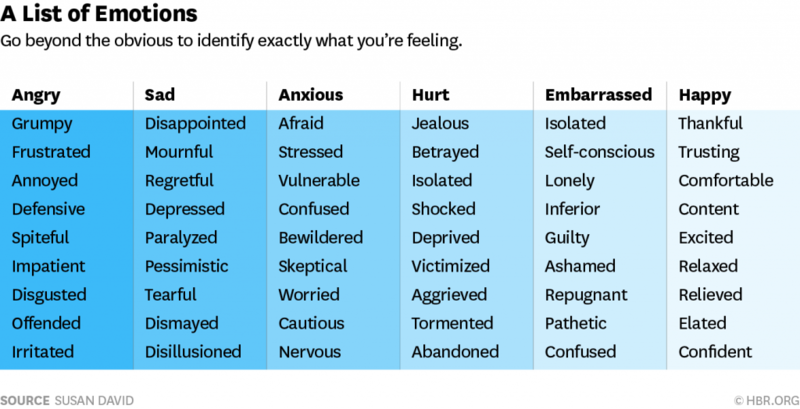 Most of the time, a lot of us struggle to identify what we’re actually feeling (“I’m just feeling off today”), and a lot of the times the most obvious label isn’t the true culprit (maybe underneath all that anger is a sea of sadness and embarrassment). The two words we hear a lot when it comes to workplace drama are a) anger and b) stress. But when we say things like “Work is stressful” or “I’m angry at my boss,” we have to think of them as onions. Ever cut open an onion before? The outside layer is filmy and tough, much like your anger and stress. But you might’ve noticed that the onion has many layers we have to peel off to get to that strong, flavorful, robust core—aka, your true emotions. Yes, just like slicing an onion, there may be tears. But those tears might just be what you need! Because when you begin to understand, describe and get cozy with your emotions, you develop a better emotional IQ, which helps deepen the connection with yourself and your relationships. See what I did there? It’s true; learning how to cope with your emotions isn’t just for your own sanity, but your spouse’s, too. For example, maybe you had a rotten day at work. You decided to set up a meeting with your boss to ask her for a raise, and she unfortunately turned down your proposal. Trying to deal with the bad news, you spent all day keeping your emotions bottled up inside in fear you might explode and, in turn, lose your job. So as soon as you get home and your bottom hits the couch, you’re a total grouch—and you just know your hubby will stay with you, even if you’re acting like a jerk sometimes. So you yell, give some sass and possibly huff and puff at every little thing he does. Hate to break it to you, but unfortunately, “a rough day at work” won’t cut it in the relationship world. We need a more specific vocabulary for our emotions, because incorrectly labeling how we feel makes us respond incorrectly. Your approach might be different if you say, “I’m sorry, I didn’t get the raise I wanted, and I’m worried my boss thinks I’m a terrible employee. I feel undervalued, and it makes me disappointed in myself” instead of using “I had a rough day at work.” Now we’re getting somewhere. And now you get to think clearly and find a solution to the problem—without bringing your husband down with you. 2. Give your emotions a rating. Now, take your three words and rate them on a scale from 1-10, one being not strong at all and 10 being extremely strong. By doing this, you may find that your emotions are either much stronger than you were expecting or not as severe as you originally thought. This exercise is by no means a way to invalidate your feelings—quite the contrary! It’s a way to understand your emotions on a greater level and intentionally express them to loved ones, friends and colleagues. Turns out, writing about your emotions, negative or positive, is great for your wellbeing. When you write in detail how you’re feeling, you’ll gain better clarity for those feelings. Another great thing about writing? Only you have to see it. That means you’re free to say anything you want. Just be sure to stay on track and identify the true emotions underneath those first few onion layers. Work stress is inevitable, even for those who love what they do. But if every day feels like the worst day ever, it’s time to get to the bottom of it. That’s where I come in! From imposter syndrome to controlling bosses, dealing with your own struggles while working collaboratively with your coworkers—yep, we’re talking about work life. If you want to feel happy and at peace, now’s the time to do it. Let’s do this!